"Every morning, when the sun's rays first hit the mesa top, while the rest of the world was in shadow, I wakened with the feeling that I had found everything, instead of having lost everything." 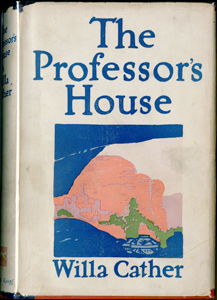 First serialized in nine installments in Collier's from June to August, 1925. Published by Alfred A. Knopf on September 4, 1925. Published by William Heinemann Ltd. in November 1925. Published by University of Nebraska Press in 2002. Historical Essay by James Woodress. Explanatory Notes by James Woodress with Kari A. Ronning. Textual Editing by Frederick M. Link. Published in the News Letter of the CEA in October 1940 and collected by L. Brent Bohlke in Willa Cather in Person: Interviews, Speeches, and Letters.